At some tea plantations, they don’t like you taking photos. Sometimes, like here at Kora Kundah (southern India), there are even signs prohibiting it. I always wonder what this means. What do they have to fear from me taking photos? What is it they don’t want me to see? Most of the time it is simply a statement of ownership, a way of prohibiting trespassing. In reality, at the plantation of Kora Kundah, I know I’m free to go where I like and to photograph whatever I want. It is actually a great tea plantation, producing teas of high quality with organic and fair trade labels. 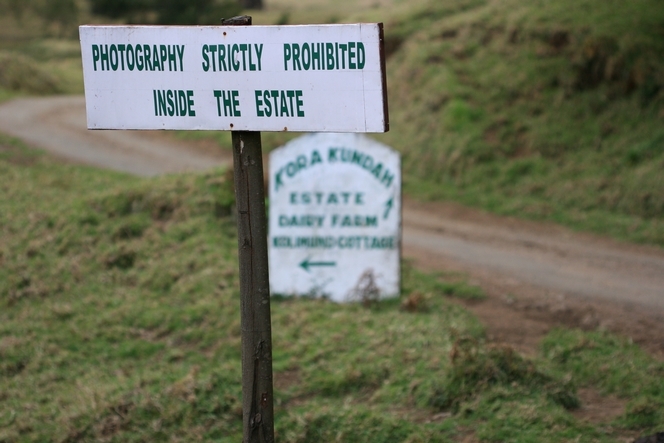 I don’t trust tea estates that limit their access or prohibit taking photos. At first I always ask why. If the reasons are not convincing, I refuse to trade and politely turn back. One mustn’t generalize, but I notice that this happens in Sri Lanka more than anywhere else.